Data-based decision-making aligns curricular instruction and behavioral supports to student and staff needs. Schools applying PBIS begin by establishing clear expectations for behavior that are taught, modeled, and reinforced across all settings and by all staff. This provides a host environment that supports the adoption and sustained use of effective academic and social/emotional instruction. 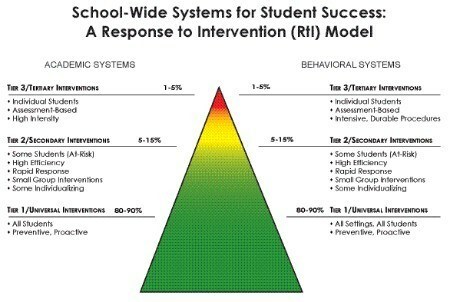 PBIS has proven its effectiveness and efficiency as an Evidence-Based Practice. (Sugai & Horner, 2007). The principles and practices of PBIS are consistent with federal education mandates such as the No Child Left Behind Act (NCLB) and the Individuals with Disabilities Education Act of 2004 (IDEA 2004). PBIS integrates state school improvement initiatives includingSystems of Support, Standards Aligned Curriculum, and Response to Intervention to assist schools in meeting Illinois’ educational goals and mandates. The school-wide PBIS process emphasizes the creation of systems that support the adoption and durable implementation of evidence-based practices and procedures, and fit within on-going school reform efforts. An interactive approach that includes opportunities to correct and improve four key elements is used in school-wide PBIS focusing on systems, data, practices and outcomes. 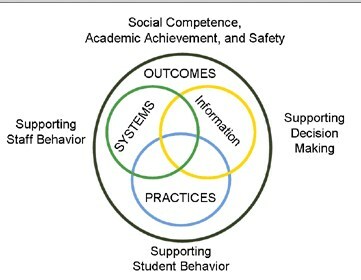 Outcomes:Academic and behavior targets that are endorsed and emphasized by students, families, and educators. Practices:Curricula instruction, interventions, and strategies that are evidence-based. Data:Information that is used to identify status, need for change, and effects of interventions. Systems:Supports that are needed to enable the accurate and durable implementation of the practices of PBS.